"There'll be no trouble. It's a peaceful march." January 30, 1972. This date was supposed to mark a significant achievement for the civil rights movement in Northern Ireland. The peaceful march through Derry should have occurred without any major confrontations or violence. Unfortunately, a tragic sequence of events left 13 civillians dead and another 14 seriously injured. The British government was determined to stop the "hooliganism" that had left some of their own soldiers dead in recent months. With orders to act with extreme aggression, the paratroopers fired live ammunition into the crowd after reportedly being fired upon. These supposed shots have never been confirmed, but a common feeling is that British soldiers acted without provocation and started a massacre. Bloody Sunday shares this view of British aggression and provides an up-close depiction of the disastrous events. Much of the action appears through the eyes of Parliament member Ivan Cooper (James Nesbitt), a determined Protestant who leads the civil rights marches. He spends much of the film's early moments spreading the word about the march and drawing citizens like a good politician to support his actions. Believing that soldiers would not disrupt a peaceful march, Cooper feels confident even when hearing reports of troops occupying the streets. While trying to cater both to tougher revolutionaries like Bernadette Devlin (Mary Moulds) and the common citizen, Cooper walks very close to dangerous ground. When some young kids start throwing rocks at nearby soldiers, the march and its representatives quickly fall into extreme trouble. Executive-produced by James Sheridan (In the Name of the Father, The Boxer), and directed by Paul Greengrass (The Theory of Flight), this film tackles the events of Bloody Sunday in quick, kinetic fashion. The shaky, handheld cameras inject us directly into the action and remove the typical barriers. In similar fashion to Saving Private Ryan or Black Hawk Down, the events seem much more realistic when viewed from this intimate perspective. Greengrass avoids using any lighting, crane shots, or other filmmaking devices to heighten the intensity. The only noticeable interruptions are quick fade-outs that occur every few minutes and provide a brief and especially needed respite. Much of this film's success is derived from its use of multiple perspectives that provide a broader view. The tale begins with Gerry Donaghy (Declan Duddy), a young man who tells his sister not to worry because it will be peaceful. We observe as he shares a tender moment with his girlfriend and then joins his friends on the streets the next morning. After viewing these events, Gerry's unfortunate fate will not come as a major surprise. Another intriguing element is the views of the British officers preparing their troops for aggressive actions. Major General Ford (Tim Pigott-Smith) stands behind the barricades and urges them to use whatever means necessary to stop the hooligans. This enthusiasm trickles down to the paratroopers on the streets, although some are not so excited. The lead officers make their plans on a large map similar to fighting a hostile war. Sadly, their targets here are women, children, and innocent young men. 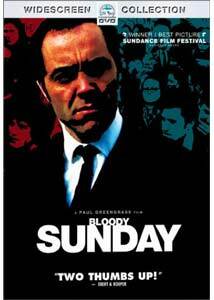 Bloody Sunday features, in large percentage, unprofessional actors who give the tale a much-needed realism. Certain of these participants actually walked in the original march, which probably made filming especially eerie for them. James Nesbitt provides a stirring emotional centerpiece and makes Cooper entirely believable. Although this picture obviously condemns the British actions, it does make their disturbing ideas partially understandable. They do not appear as caricatures or typical movie villains; instead, the leaders portray the sad military idea of "shoot first, and ask questions later." The issues of Bloody Sunday are still being resolved today with a new inquiry that hopefully will shed more light into a tragic date in British history. Image Transfer Review: Bloody Sunday's handheld cameras and muted colors make grading its technical aspects more difficult. Much of the picture looks grainy, but that fits with the realistic, documentary-style tone of the film. Luckily, this 1.85:1 anamorphic widescreen transfer succeeds and makes the chaotic events easily viewable. The shaky camera work might inspire nausea in some viewers, but it correlates well with the day's events. Despite a bit of expected haziness, this transfer works very effectively. Audio Transfer Review: This release is interesting because it contains two English versions of the 5.1-channel Dolby Digital transfer. The first one stems from the domestic United States release, and the other presents the original UK theatrical version. I could notice few major differences between the two soundtracks, but I imagine the US track was cleaned up to give audiences a better chance to understand the accents. Both versions offer impressive sounds that convey significant power and clear sound effects. The complexity is not especially amazing, as the rear speakers could have been utilized to a greater extent. However, the overall presentation does impressively draw the viewer into the tense story. 2 Feature/Episode commentaries by Writer/director Paul Green grass and actor James Nesbitt; producer Don Mullan, writer of the original book "Eyewitness Bloody Sunday"
Extras Review: Bloody Sunday contains a small collection of extra features that all provide worthwhile material. The most compelling entry is a commentary track from Paul Greengrass and Paul Nesbitt. The writer/director does most of the talking and injects plenty of interesting views about the conflict. Instead of covering the technical details, he really discusses the characters and explains the larger picture. Nesbitt spends much of the time asking questions and remaining in the background, but he also provides some effective statements. A second commentary comes from co-producer Don Mullan, who wrote the original book, Eyewitness Bloody Sunday. The author is obviously very knowledgeable, and he does provide some compelling insights, but there are some serious breaks here. It is definitely worth a listen, if you don't mind the silent interludes. This disc also includes two informative featurettes that decently complement the two commentaries. Bloody Sunday: History Retold runs for about 13 minutes and contains intriguing conversations with the director, producers, and actors. Avoiding any promotional jargon, this feature also offers behind-the-scenes footage. Lastly, Bloody Sunday: Ivan Cooper Remembers gives a brief look at modern Derry from the perspective of the real Ivan Cooper. He discusses the important sites with James Nesbitt in this seven-minute piece, which provides a worthy connection to the real events. It is an unfortunate sign that supposedly democratic governments (including the United States) continue to feel threatened by their citizens' peaceful protests. Bloody Sunday offers a definite warning towards this type of action, which can necessitate more violence. The massacre in Derry helped to spur the future activities of the IRA and gave it plenty of new members itching to fight the British government. Paul Greengrass has crafted a remarkable picture that feels amazingly human while portraying a stunning and depressing event.